November 2003 - All of the IT2 Challenge entrants have returned home from Road Atlanta, the Georgia clay has been washed off of their rides - and four drivers of cars that don't belong in ITS have a little bigger budget to prepare for the 2004 season. Greg Amy traveled from Middletown, CT to capture the IT2 "pole" with his Kakashi Motorsport Nissan NX2000. For being the fastest qualifying IT2 car in the ARRC™ ITS sprint race, Greg earned an Isaac Intermediate Head and Neck Restraint device with additional helmet mounts and adhesive kit. Greg also captured the $300 LOCKWOOD RACEWORKS award for winning the 2003 IT2 Challenge: He finished 12th overall in a field of 27 ITS qualifiers, after overcoming adversity to replace an comprehensively blown-up engine after the pre-event test day. SCCA rookie notable Kevin Fandozzi of Birmingham, MI went home with $250 - including the Anglade/Amy Hard Charger award (for the greatest improvement over his qualifying position) and the the second-place LOCKWOOD RACEWORKS award - the result of a 19th-place overall finish in his ITS Dodge Neon and Matt Downing's post-race DQ for exceeding the sound limit. The $100 3rd-place LOCKWOOD check was some consolation for Downing (Pickerington, OH), who lost 2nd in IT2 (for 17th overall in the ITS sprint) when his www.cera.net Honda Civic EX was excluded for the aforementioned sound violation. Matt was also presented with a surprise award for being the 2nd-place IT2-eligible qualifier in the S race - an Isaac demo restraint system presented by Gregg Baker of Isaac, in recognition of Matt's effort and enthusiasm over the long haul from Ohio. Product awards further sweetened the deal for IT2 Challenge entrants: The Raceshopper.com brake product contingency certificates valued at $100, $75, and $50 went to Amy, Fandozzi, and Downing, respectively; and Amy received one free Hoosier race tire from Appalachian Tire Products, for winning the IT2 Challenge on Hoosiers. 29 October - Appalachian Tire has agreed to become the most recent addition to the list of supporters of the Lockwood Raceworks IT2 Challenge, by providing one free tire to the highest finishing IT2-spec car in the ITS sprint race. This addition brings the total value of IT2 support to more than $2000! If more than ten IT2 cars are entered for the event, the award doubles to credit for two tires, redeemable only through Appalachian Tire. To be eligible, a driver must run on Hoosier tires for the duration of the ARRC™ and display Hoosier stickers on the car. Please note that this support is being offered by Appalachian Tire of Louisville, TN rather than by ARRC™ official contingency sponsor Hoosier Racing Tire Corporation. A unique feature of this offer is the "instant gratification" deal, under which the award may be applied to reduce a racer's trackside tire support credit card bill at the event. Run Hoosier tires for duration of the ARRC™ and display Hoosier stickers on the car. This award is from Appalachian Tire, not the Hoosier Racing Tire Corporation. 15 October - The final piece of Lockwood Raceworks' support for the 2003 IT2 Challenge is in place, with the announcement that the highest-placing IT2-eligible car in the ARRC™ ITA sprint race will receive $150 to cover expenses. It was impossible for the early '90s Acura Integras and Saturns in ITA to compete with the ITS Civics, Nissans, and VW GTIs but this award should go some way toward recognizing the efforts of another would-be IT2 driver. 09 October - The IT2 Initiative is very pleased to announce Lockwood Raceworks (SL Racing, Inc.) as the title sponsor for the 2003 IT2 Challenge. Improved Touring and Legend car specialist Lockwood Raceworks is a family-owned and operated business in Gainesville, Georgia that offers customer car preparation, used racing car sales, and a growing online catalogue of racing parts and supplies. Though specializing in performance Hondas and Volkswagens, Raceworks offers performance parts for all import and domestic cars, as well as styling mods, graphics, and pit and safety equipment. Raceworks owners Sam and Grant Lockwood are avid racers themselves, having raced SCCA Improved Touring cars since 1995 and spent four seasons in the Speedvision Touring Car series. They are currently campaigning the Precis Vodka Formula Mazda, driven by Grant in SCCA Formula Mazda Pro and Club, as well as in NASA’s East Coast Honda Challenge. Lockwood Raceworks' web site is available at www.lockracewrks.com. 06 October - Please be aware that the 2003 IT2 Challenge is in no way officially associated with the American Road Race of Champions™ (the ARRC™). IT2 is not a recognized racing class at this event, the IT2 Initiative is not among the official event sponsors, and the IT2 concept is not endorsed by ARRC™ or Atlanta Region SCCA® officials, the region, or the Sports Car Club of America®. It has been suggested that members of the racing public may have been led to believe otherwise by information posted at this site or on the various club racing bulletin board forums. If this is the case, organizers of the IT2 Initiative and the IT2 Challenge apologize and assure all interested parties that it was not our intent to mislead anyone. It has also been suggested that the IT2 Initiative should be prohibited from distributing the contingency awards that have been generously donated by supporters of the IT2 Initiative and the IT2 Challenge. It is important for all interested parties to understand that IT2 organizers do not accept the imposition of any action attempting to restrain legal trade - in this case, the disbursement of promotional awards based on on-track performance - by any individual or group, absent state or federal statute providing for such. We fully intend to disburse any and all awards as planned. However, we would like to publicly offer the companies and individuals who have committed to award money and products the opportunity to withdraw their support, recognizing the potential ill will that might be associated with with any misunderstanding arising from recent communications by this organization. While actions of IT2 organizers were not the catalyst in the escalation of this situation from misunderstanding to conflict, we fully recognize and accept our responsibility to provide promotional value and good will appropriate to the high level of support demonstrated by our corporate and personal sponsors. American Road Race of Champions™ and ARRC™ are trademarks of the Atlanta Region SCCA® and event organizers. Any uses of these marks herein are for identification purposes only and must not be construed as suggesting any formal affiliation between the trademark owners and the IT2 Initiative Lockwood Raceworks IT2 Challenge. IT2 is not an official sponsor of this event. 17 September - NE Region IT2 Nissan racer Greg Amy has stepped up to match Ony Anglade's Hard Charger bounty so the IT2 Challenge driver who most improves his or her position between the start and finish of the ITS race at the ARRC™ will take away a cash award of $50. Greg and his Kakashi Racing NX-2000 are looking forward to some great competition at Road Atlanta in November. 8 September - RaceShopper.com has become the most recent addition to the IT2 Challenge contingency awards line-up, graciously offering the top three IT2 finishers in the ARRC™ ITS race certificates redeemable for Hawk, Performance Friction, or Ferodo racing brake pads. The first-place finisher will earn a $100.00 product certificate, while second and third will win $75 and $50 certificates, respectively. To qualify for this award, entrants must meet the general IT2 Challenge eligibility requirements at the bottom of this page and in addition, must display one RaceShopper.com decal on each of two sides of their car for the duration of the event. For more information on brake pads, calipers, rotors, lines, fluid and other brake system parts for your racing car, contact Edwin Robinson at 1-800-733-8380 or visit the web site at www.RaceShopper.com. 3 September - The manufacturers of the Isaac® Head and Neck Restraint system announced today that the fastest IT2 Challenge qualifier at the 2003 IT2 Challenge will receive a free Isaac® system. The beautifully engineered "Intermediate" model, to be awarded after qualifying at Road Atlanta, retails for $895 so the battle for pole will be for more than honor alone. This support from the Isaac® folks brings the total value of IT2 Challenge contingency awards to something in excess of $1570. Because the Isaac® system uses shock absorbers to minimize injuries suffered by racing drivers, rather than by limiting the position of the head, the Isaac® offsets dangerous head loads without unnecessarily restricting head position. In crash tests conducted at Wayne State University's Bioengineering Center, Isaac® performed as well as any product ever tested, reducing head loads almost 90%. 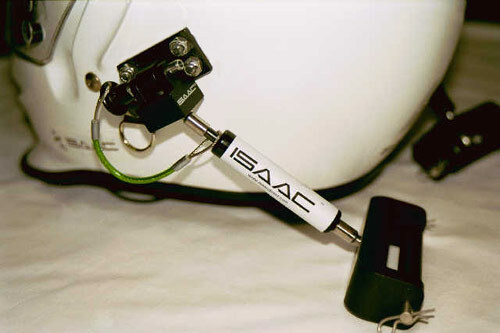 Further, because it is not "worn" Isaac® comes in one size and can be used in any style race car, by any driver having a set of helmet mounts. It is easily moved between race cars and, because it is modular, racers can upgrade components as new designs become available. 2 September - ITA Miata driver Ony Anglade of Georgia has posted a bounty on "real" ITS cars, offering a $25 cash bonus to the IT2 Hard Charger who most improves his or her position between the start and end of the 2003 ARRC™ ITS race. Ony will be at the event so please say "thanks" for the support. 19 August - The IT2 Initiative announces the IT2 Challenge Contingency Sponsorship for the 2003 American Road Race of Champions™, to be held November 7-9 at Road Atlanta in Braselton, Georgia. The IT2 Initiative is a grassroots movement to reclassify currently uncompetitive four cylinder front-wheel-drive cars out of SCCA's® Improved Touring Sports class, one that is dominated by higher horsepower, rear-wheel-drive luxury sedans and GT sports cars. The IT2 Challenge furthers this movement by offering a minimum $650 cash purse to the top three placing IT2-eligible vehicles entered in the ITS class at the "regional run-offs." To be eligible for any and all IT2 Challenge contingency prizes, competitors must compete in the ARRC™ in the ITS class while driving a vehicle eligible for IT2, registered with the IT2 Initiative program, and running with the required IT2 sponsorship decals. Competitors must prepare their vehicles to meet current SCCA© ITS regulations. The IT2 Initiative welcomes any and all eligible competitors to race with us during this event. Details and entry information will be available on the program's web site at http://www.it2.evaluand.com. For more information visit the ARRC™ IT2 Challenge Forum.